Paris Haute Couture Fashion Week always provides the most jaw-droppingly good inspiration at such a terribly dull time of the year. As well as hosting the magic that unfolds on the runways, this is where the style industry's most elaborate peacocks come out to trial 2018's early trends and showcase a selection of ultra-luxe new designer investments (of course, it's still all about the "total look"). Decorative coats, new designer bags and princess dresses have all been key thus far. The City of Light looks rather different this time of year, and we had a fabulous photographer on the ground to capture it all. Go through the gallery to see Romina Introini's best shots. Bum bags are trending even on the streets—although they're velvet and covered in crystals, obviously. When is a coat not just a coat? When it's entirely embroidered in red poppies, that's when. This may not be subtle, but it is rather fabulous. Shop our favourite leopard-print pieces. The cult Mango Bow Blouse (£50) even made it to the chicest corners of Paris. Where else can you swish around in tulle? Kudos for grounding such a whimsical dress with a double whammy of black leather. Hear us loud and clear: Dior's logos are going to be everywhere in 2018. This coat deserves to be analysed up close. What did we just tell you about Dior already? Olivia Palermo's found some new favourite boots, and they're a very versatile knee-high pair in tan. Copying immediately. Gabriela Hearst's sculptural bags are a favourite amongst the elite fashion crowds. Patchwork jeans + stilettos = our most trusted combination these days. Dainty bags, embellished shoes and princess dresses are par for the haute couture course. Mom jeans and snake-print boots may feel very eighties, but that is the era many of the coolest girls are channeling right now. Olivia Palermo is out and about holding firm to her favourite jacket style: the bomber. Fendi's Rockoko boots are the ultimate statement piece right now. This shimmering pink dress looks elegant thanks to the bias cut and demure draped neckline. So many ways to wear denim and a jacket—your options are truly endless. Sock boots, sock boots everywhere. Although the 1970s haven't played a big part on the runways recently, it's still a favoured decade to dip into for fashion lovers. If you're looking to enliven a grey work outfit—just add red footwear. We've seen a wave of ultra-baggy jeans coming in. Louis Vuitton's monogram comes in many forms, but this circular bag is particularly neat. Will we ever get bored of pink? No. Raw fabrics and homespun detailing are all on the agenda for spring 2018—fashion girls are already keeping the trend modern with tailoring and trainers. Our French correspondant, Deborah Sebag, has already bagged (get it) a pair of these plastic-covered Jimmy Choo's from the Virgil Abloh Off-White collaboration. Caroline de Maigret showing us all how true Parisian style is done. Everything Pernille Teisbaek wears right now is styled with unusually coloured tights and matching shoes. Anya Ziourova adds some glamour to a classic combination with crystal earrings. Tartan, plaid, floral, faux fur… sometimes more is more. Another day, another girl showing us cowboy boots really are back. Doina Ciobanu paired hers with a boho maxi skirt to show them off. If you're ever wondering about investing in a trouser suit, ponder no more—they are set to be big news this spring. White shoes are still the fashion crowd's favourite footwear option. Gold boots and a cape—this street styler is like a modern-day super hero. Who knew gold over-the-knee boots could be so versatile? Long, sweeping layers in neutral colours will always look chic, no matter the city they're in. A special congrats goes out to Veronika Heilbrunner and Justin O'Shea—the fashion couple just announced that they'll be having a baby. 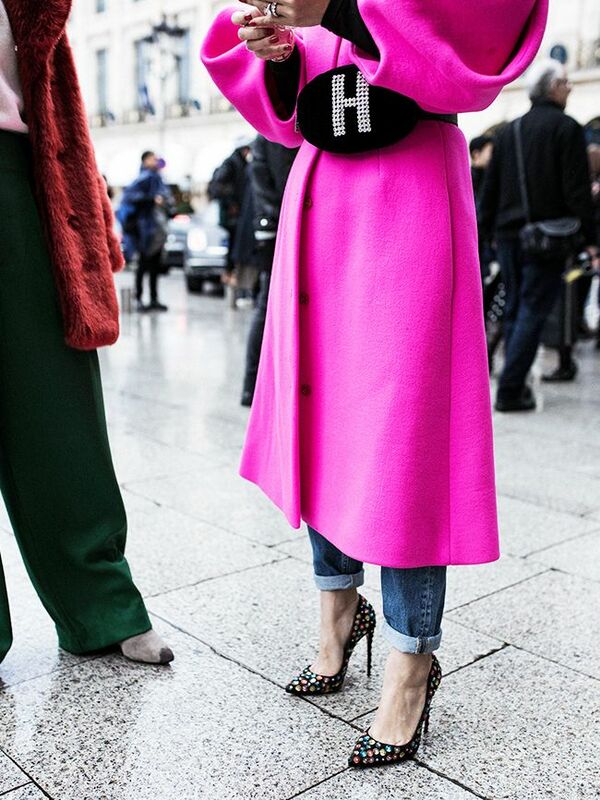 No coat is too much for the streets of Couture Fashion Week—so pink sequins are a very viable daytime choice.